Robert Dreicer, MD, discusses the significance of the abstracts presented throughout the day on January 26 during Evening Highlights: How Will Today's Presentations Impact Clinical Practice? 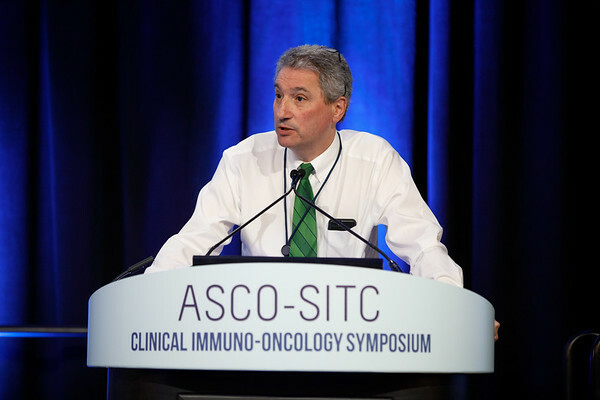 San Francisco, CA - 2018 Clinical Immuno-Oncology Symposium – Robert Dreicer, MD, discusses the significance of the abstracts presented throughout the day on January 26 during Evening Highlights: How Will Today's Presentations Impact Clinical Practice? at the 2018 ASCO-SITC Clinical Immuno-Oncology Symposium here today, Friday, Jan. 26, 2018. The conference, which is a collaboration between the American Society of Clinical Oncology and Society for Immunotherapy of Cancer, is focused on clinical and translational research in immuno-oncology and the implications for clinical care. Photo by © ASCO/Scott Morgan 2018.